Cayuga Boat Company from Cheektowaga, NY. Just looking for someone who wants to take the time to restore her. Like new Trailer not Included, unless purchased for and additional $500. I am trying to get some information on my 16 foot Cayuga. I'm originally from East Aurora New York, but now live in Savannah Georgia. My father gave me his 16 foot Cayouga. I am in the middle of restoring it. I grew up boating in Lake Erie Chautauqua lake. I was wanting to know more information about our boat, does anyone know how many of these boats are still out there? Or what were their original Colors? I want to restore this blue so it can be a Showboat or just an antique to keep in my family my son will own it one day. Please contact me if anyone has any information, I can send pictures. My boat is in very good shape with minor stuff that needs to be done. I was fortunate enough to have been left my fathers 1958 Cayuga which he bought brand new from Cayuga. I fished many small lakes as a child and eventually upgraded for bigger lakes. I still have the boat and take it out a few times a year, its in very good condition. Anyone have an idea what its value is? I am the second owner of a 1960 16 ft.
Cayuga with a 20 HP McCulloch outboard. History of the Cayuga Boat Company. The company was established in 1950 on Harlem Road in Cheektowaga. My dad was the founder. 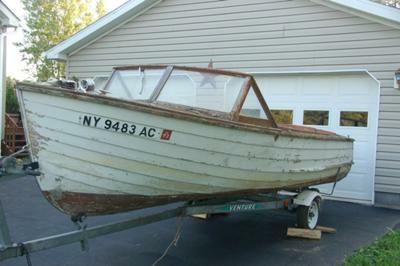 The "Fisherman" was the first model, she was a 14' open deck outboard with the classic lapstrake plywood hull. After the success of the "Fisherman" Dad was convinced that larger hulls would be a market favorite. He built the "Capri", a 16'classic with a full mahogany deck, windshield and remote controls for the motor, typically an Evinrude outboard. Next was the 17' "Cavalier". Similar construction to the "Capri",she was Dad's best seller. Last of the line and the largest of the fleet was the "Clipper", a 19' beauty that as a child was our family boat which was moored at the Small Boat Harbor in Buffalo, NY. About 30yrs ago I(rescued) one of these (same model) from the bone yard boat, motor, trailer. 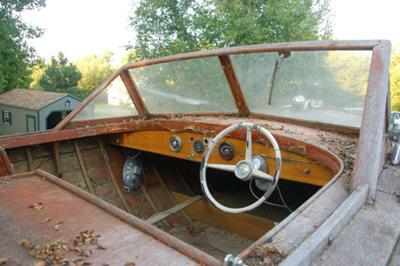 The hull was full of "Bondo" and rot below the waterline and the '58, 50hp Evinrude was toast. I had purchased new parts from AAA Marine and re-built the powerhead (~$850.). I replaced the entire transom and well assy, steering assy, dash, decks, a few planks and interior woodwork ($400.). The trailer was fairly new. The boat pulled 2 skiers well and was lots of fun. I will recommend only skilled determined buyer for this boat since Lapstrakes like this are not easy to re-build. The boat and motor weighs ~ 1600lbs. The trailer shown here appears undersized for the boat/motor combination. What is the history of Cauga Boat Company? I have a 1963 runabout with a 1964 25th Annivesary 50hp Merc and want to know more about the Cayuga Boat Company. I called the Cheecktoaga Chamber and Historical Museum and no information yet. Anything is helpful just to know some history. Any history on this boat? Do you know anything about the history of this boat? Specifically was the deck ever covered in vinyl? Any appearance of a patch along the rear interior lapstreaks? I did call your phone number. I have 1960 16 ft. Cayuga boat with a 28 H.P. McCullough outboard with tilt bed Holsclaw trailer. If this boat is the same quality as its builder (Bernie Walczak)it must be a winner.I never knew such a fine person as Bernie Walczak.He was also the smartest man I ever knew. My dad, Bernie Walczak, was the owner and founder of the Cayuga Boat Company in Buffalo N.Y.. This 17 footer was one of the best selling boats in the custom line for use on Lake Erie and the fingerlakes. 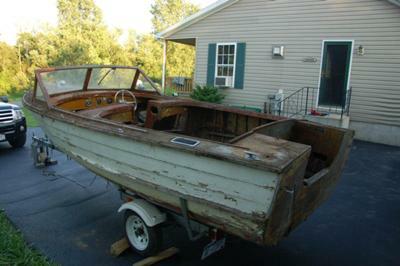 They are very seaworthy and this one just needs some TLC to restore it to it's original beauty. I have the same boat...purchased in 1969 and cared for throughout. 1960 Johnson 75 hp still on it and working. it looks just like my thompson....(whitch is also for sale with alot of extras.